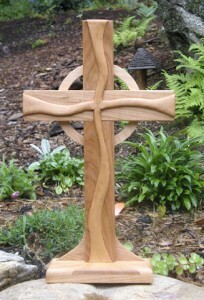 Custom crosses normally cost $35 for the standard size provided that the design time is not too extensive. 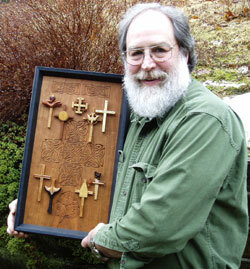 The design of this cross is based on the windows that adorn the front of the church building. The clear glass and the unique ‘pyramid’ combine to draw the attention of the people away from themselves and ‘out’ into the world for that is where ministry happens. 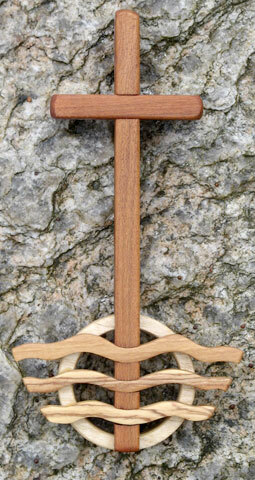 This cross is given to newly elected/ordained elders and deacons. 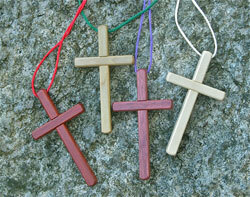 The “Cross of the Path” honors and affirms the various ‘paths’ that each of us take on the journey of faith. They all arrive at the center of the Cross – at the heart of life where we encounter the living God. 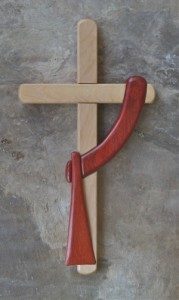 This was inspired by Jesus’ words: “I am the Way, the Truth and the Life.” The cross is made of cherry. The paths are made of European Beech. The nimbus is made of yellow Birch. This is a Deacon’s Cross. Deacon’s stole appears to be draped across the front of the Cross. 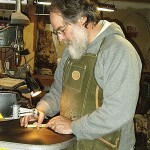 The stole, sash and cross are all joined together to stabilize and strengthen the piece. 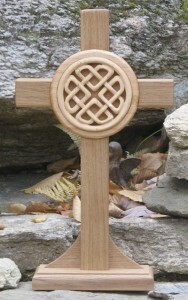 This cross can be made in several different sizes. Please contact me directly if you are interested in this design (woodsyshook@gmail.com). What to give a colleague who has dedicated his life to pastoral counseling? What to give a person who understands the intricacies of interpersonal relationships and who has always had a vision of wholeness at the center of faith? 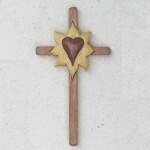 What to give a person of faith who doesn’t look for the beginning or the end but is appreciative of the process and is attentive to the details of relationships? Give him a Celtic Knot that has no beginning or end- no up or down – no front or back! Using an ancient Pictic knot (that I call the Eternal Love Knot), I set the White Birch knot into a medallion made of Western Alder. This is then inset into a ‘stand alone’ cross of White Oak. This is a replica of the Cross that hangs in the Sanctuary of First Presbyterian Church in Birmingham, Michigan – the church in which I was Confirmed and where I was ordained in 1980. It is made of very old and historic Cherry and Holly. 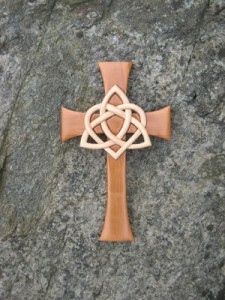 This Triquetra and Heart Celtic Knot is set into a Flared Cross. It was given as a Wedding Anniversary Gift. This is a wooden copy of the silver cross worn by the General Secretary of the National Council of Churches. The cross is made of submerged cherry. The ring is made of myrtle. 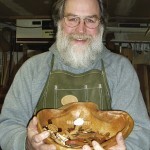 The three waves are made of olive wood using both the sap and heart wood. 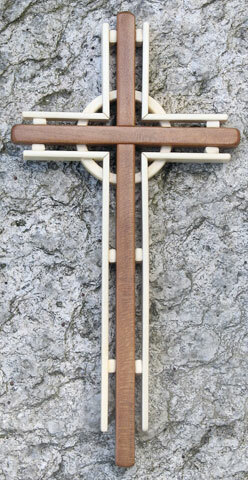 I was asked to design two special cross for a minister to give to his mentor who was returning to Ghana. The nyameohene image (on left) is made of curly maple with black walnut. 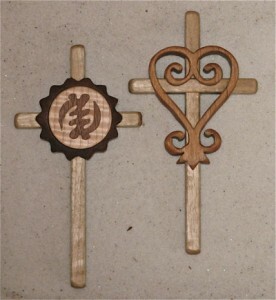 The sankofa image (on right) is made of Western Alder.